After a long, dark winter and a fairly erratic spring, a serum laced with what’s known as the “sunshine vitamin” seems promising. While you probably know that your body naturally produces vitamin D when skin is exposed to UVB rays, or that you can ingest it via oral supplements or foods like milk, fortified orange juice, and fatty fish to boost immunity and promote bone and heart health, the ingredient’s topical benefits are a more recent discovery. Many derms are championing vitamin D2 (D3 is the form that works internally) as a new way to turn back the hands of time. “It’s another tool in the toolbox,” says Connecticut-based dermatologist Mona Gohara, M.D. Traditionally used to treat conditions like psoriasis, vitamin D could have a similar anti-inflammatory effect on healthy skin. Better yet, research indicates the vitamin has powerful anti-aging properties: According to a 2004 study, applying it topically to hairless mice was found to significantly ward off wrinkles and protect against environmental aggressors (like solar UV radiation) by promoting skin cell turnover. “Just like antioxidants work to reverse and prevent sun damage, that’s the theoretical mechanism of this type of topical vitamin D,” Gohara explains. And while scientists can’t exactly speed up the arrival of spring weather, a host of new formulas laced with vitamin D can help erase the visible signs of too much fun in the sun. 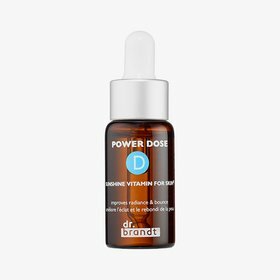 Dr. Brandt’s Power Dose Vitamin D contains alfalfa extract (a natural source of the nutrient) to prevent collagen and elastin degradation, a trio of free radical–fighting antioxidants, and chicory root extract to strengthen skin’s barrier function. In addition to a high level of vitamin D, Zelens’s Power D High Potency Provitamin D Treatment Drops feature fine line–plumping hyaluronic acid and moisturizing omega-3 and -6 fatty acids. 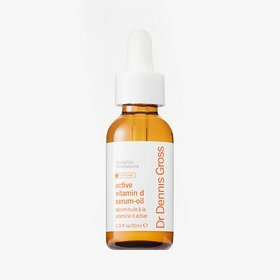 And Dr. Dennis Gross’s Active Vitamin D Serum Oil offers a few extra perks as well, including skin-refining retinol, exfoliating salicylic acid, and a firming peptide.